As a wise man once said, let’s start from the beginning. However, in the world of NFL free agency, successful (or unsuccessful) drafts, and injuries, the “beginning” seems like just yesterday. For that very reason, we’ll take a look back on the four AFC West teams before looking forward to each outlook. 2013 Record: 13-3, AFC Champions. What hasn’t been said about the Denver Broncos? After leading the league in point differential (+207), they seemed destined to represent the AFC in the Super Bowl after finishing up with the 1 Seed and a 13-3 record. After cutting through a red-hot Chargers team and then the New England Patriots in the AFC Championship, the Broncos failed to show up in one of the most lopsided Super Bowls we’ve witnessed in a long time. All of the records set by Payton Manning, the dominance of one of the best divisions in all of football was quickly forgotten not because they had lost the Super Bowl, but the fashion in which it was squandered. 43-8 has been the only number that stuck with this Broncos team throughout the offseason. That kind of thrashing can cripple a team, cause them to look elsewhere, but not this Broncos side. Aside from those who will be returning from injuries (Von Miller & Ryan Clady), the Broncos realized that their weaknesses last year could be addressed through free agency. A serious soft spot was that of the aging Champ Bailey at cornerback, so very neatly they signed New England’s best cover corner Aqib Talib and spent their first round pick on CB Bradley Roby out of Ohio State. Von Miller has become a concern with injuries and suspensions, so very neatly they provided more reinforcements to rush the quarterback in former-Cowboy DeMarcus Ware. 12-4, AFC West Division Winners. 2013 Record: 11-5, AFC Wild Card. Lost in first round. The Kansas City Chiefs were truly a team of two halves. The first half of the season was littered with weak opponents (Jaguars, Texans, Browns) and favorable home matchups (Giants, Raiders), leading to a fast 9-0 start. Then came the Bye Week and ouch… The Chiefs proceeded to lose both matchups to the Broncos and both to the Chargers, finishing with just 2 Wins in their last 7 games. The fast start was enough to secure the top Wild Card spot in the AFC under first year head coach Andy Reid and newly traded for quarterback Alex Smith. In what was one of the more exciting playoff games, the Indianapolis Colts beat Kansas City 45-44 in the opening round of the playoffs. The big stumbles of Kansas City down the stretch has made many people wonder about their legitimacy in a tough AFC West. Some big question marks remain about offensive weapons outside of Jamaal Charles, a secondary that lost CB Brandon Flowers to in-division rival San Diego, and their ability to compete with Denver and San Diego as they look to return to the playoffs. In this author’s opinion, the resurgence of the Kansas City Chiefs was greatly accelerated by a terrible first half slate of opponents in 2013, something that will change quickly and harshly given that they will face the Broncos, Patriots, Chargers and 49ers, all within their first 6 games. Late season games against the Cardinals and Seahawks will be no walk in the park either. 6-10, 4th in AFC West. 2013 Record: 9-7, AFC Wild Card. Lost in second round. The San Diego Chargers were the second team in the division that had a ‘tale of two halves’, one that was exactly opposite of their rival, Kansas City. After starting 5-7 with injuries to the defense and growing pains under first year head coach Mike McCoy, the San Diego Chargers put together another impressive second half, winning 5 of their last 6 games and earing the Wild Card berth. In the playoffs, the Chargers beat the AFC North division winners in Cincinnati before losing to the Denver Broncos in the second round. 10-6, 2nd in AFC West, Wild Card. It was much the same for the Oakland Raiders in 2013, who have become one of the more hapless organizations in football for the better part of a decade. 2013 marked the 11th straight season in which the Raiders missed the playoffs, a stark contrast to the 2013 season in which every other AFC West team made it to the playoffs in 2013 alone. The Raiders started off well considering their expectations, going 3-4 through their first 7 games with big wins over San Diego and Pittsburgh. However, the months of November and December were especially cruel to the Raiders, going 1-8 during the final two months of the season. The Oakland Raiders needed a facelift after their 2013 season, and they seemed to book a great plastic surgeon. This team is completely different in almost every way. Last year was plagued by inconstancy from the backfield positions, the Raiders addressed both by signing RB Maurice Jones-Drew from the Jaguars and QB Matt Schaub from the Texans. However, the biggest move was that of drafting second round pick out of Fresno State, QB Derek Carr, who has since won the starter job, and rightfully so. However, with all of those massive changes on offense, it is the defense which looks better than ever. In addition to second rounder Derek Carr on offense, the Raiders scored what many consider the most NFL ready player in linebacker Kahlil Mack. Along with Mack, their defense is littered with newly acquired veteran talent such as Justin Tuck and LaMarr Woodley up front as well as Charles Woodson and Carlos Rodgers in the secondary. Make no mistake about it, this Raiders’ defense will not only be a vast improvement from the 2013 shell, but has the potential and talent to be a top 10-15 defense by the end of the year. 8-8, 3rd in AFC West. The AFC South is similar to the French film industry. The Indianapolis Colts are that French film that comes along once every twenty years that resonates with people that couldn’t care less about the genre. They stick in your craw. You want to watch it over and over. They never get dull. Even with this Soul Asylum style of “Runaway Train” that the Colts have become, every year it seems that there is some reason to want to love a team in this division that won’t lead it. The success of the Texans in recent memory (save for last year), made this possible. Light the ignition on 2014 and there are some story lines in the American South. I’m not talking about Ferguson, MO, or teenagers breaking into Ray Allen’s Miami home looking for bling and Pitbull mix tapes. It’s easy to say that Indy will run away with the crown once again, but will it be such an easy path this time around? Let’s face it, nearly the entire AFC basically sucked-out-loud last year and there seems to be the same sentiment floating around as we inch closer to this year’s kick-off. The Colts took this division by four games in ’13 finishing 11-5, and Andrew Luck and the boys aren’t looking to stroll off the mountain any time soon. With all of the excitement that surrounded the Titans and their young, talent laden team, the injury and discontentment bugs still tally-whacked them to a 7-9 record. Honestly, that’s not bad for the AFC. I picture Brad Pitt in “Money Ball” saying “There are rich teams and there are poor teams. Then there’s fifty feet of crap, and then there’s us.” when I think about the AFC as a whole, and the South is it’s red-headed stepchild, which is ironically fitting for something “southern”. Justin Blackmon will redeem himself during a season long suspension wherein he saves his 6 year old niece from taking a swig of his Red Berry Ciroc by jumping off a bar stool and busting his eye open on the corner of a shag covered bar. The rest of the story lines go something like this: Chad Henne’s play will be unremarkable, but not terrible. The Jags will lose 4 of their first 5 games (look out Washington!) and everyone will begin to jump on the Blake Bortles bandwagon until a spring breaks and the fucker is tilted. Jake Locker will enjoy a solid running game behind Bishop Sankey, and a fan base fueled by Jack Daniels – until he gets hurt again of course. The Texans’ windbags will sporadically complain about Jadeveon Clowney’s work ethic, but the unit overall will be better with him. What probably won’t happen: Hakeem Nicks will have an all-pro year and catch 100+ balls thanks to a change in scenery and a huge upgrade in signal caller. The Colts will sling the ball, but it’ll be more like a fine Nutella spread than a torpedo-like hardboiled egg eating contest. Ryan Fitzpatrick will lead Houston to a Wild Card win over the Chiefs (hahahahahaha sorry). The WR corps in Tennessee will become the latest version of “The 3 Amigo’s”, and Justin Blackmon will redeem himself during a season long suspension wherein he saves his 6 year old niece from taking a swig of his Red Berry Ciroc by jumping off a bar stool and busting his eye open on the corner of a shag covered bar. What? That’s been done? HASN’T been done? That’s confusing man. Your best option if you’re a fan, stadium worker, video assistant, tour guide, coach, etc. of an AFC South team is to remember that the games will go on. Sure, you’ll lose a game in JAX, with the Jags having to go to London on November 9th, but clearly you guys barely show up as it is. Tickets will be bought and sold. Diehard’s will buy another shirt. Denard Robinson will carry the ball 21 times for 59 yards. Mediocrity and outright putrid failure is okay, it’s the NFL, and even the AFC South gets to participate. I bet you’re all shocked the SoulSista got dibs on the AFC North preview. Well you’re all in for a real treat…I got plenty to say about it. Hopefully you get some great incite to a division which has drawn an AWFUL lot of attention this offseason with Johnny, Ray Rice, and an ongoing frustration Big Ben has been having with his contract issues. Even more so, I bet I could slide a fantasy football tid-bit in here for you to enjoy. I’ll start with what appears to be the least talked about team in this division and that’s the Cincinnati Bengals. Despite an inept performance in the playoffs again last year, the Bengals are still the team to beat in this division. They still have a top-3 WR who shows no signs of letting off the gas, a QB (although I did hint last week, is in a “Make-or-Break Season”) that still can throw with the best of them. Dalton may not be as flashy as your Mannings, Brady, Rodgers, etc but his numbers are surprisingly on par with a lot of them. Last year he threw for nearly 4300 yards, had a QBR of 88.8 and that was in large part to the 33 TD passes he had (he added 2 on the ground as well.) The “Red Rifle” may have something to prove this year as to avoid being lumped in with the Romo discussions for playoff appearance, but you can rest assure that bidding a meltdown, Dalton will lead his offense to another division title….and that stout D will make sure it’s a done deal. They do have some heavy hitting opponents this year though so it will not be an easy run for them. They have NE in Week 5, CAR in Week 6, IND in week 7, NO Week 11, and DEN Week 16. The good news for the Bengals is with so many question marks with their divisional opponents…maybe a 9-7, 10-6 record will be enough to get into the second season. Big Ben may be known to extend the plays and swat off defenders, but he’s going into his 11th season and if he’s looking to get another 4-5 year deal out of the Steelers, it’s crucial he minimizes those chances this year. Next on the agenda is the Pittsburgh Steelers. The Steelers yet again had a very anti-climactic offseason as for trades, free agency, and the draft is concerned. They gave a one-way plane ticket to Emmanuel Sanders for DEN and they managed to tick off their franchise quarterback with this whole contract dispute. I get your philosophy may be to play your contract out and then we’ll give you another deal…but you should take notice when a man looks at his fingers and sees two Super Bowl Rings on it and looks to you and says “We can make an exception right?” I’ll take a moment to give Todd Hailey his dues, despite butting heads with Big Ben last year, he came up with a playbook that gave his QB more opportunities to throw the ball while taking less hits in the process. Big Ben may be known to extend the plays and swat off defenders, but he’s going into his 11th season and if he’s looking to get another 4-5 year deal out of the Steelers, it’s crucial he minimizes those chances this year. This is big for Ben, he’s publicly came out and said he wouldn’t play for another team, so despite my personal hatred for the individual, expect some magic from him this year to prove he worth more dollars and more years. It works to his advantage he could have the best running back in the division as well in Le’Veon Bell. That man can dance and if he plays all 16 games this year, expect some top-10 rushing numbers out of him. I’ll leave it at that though for the Steelers. I’m too fearful to say if the 0-6 start of last year is the true Steelers team of now, or the 8-2 team that finished the year. Next, my Baltimore Ravens. Coming off a disappointing season where all they had to do was win 1 of their last two games to make it into the playoffs. This year they are circling a lot of question marks again. Ray Rice missing two games this season is a big deal, he may have had a rough season last year but with a healthy offensive line this year and a better attempt at the vertical game that Harbough wanted in the first place should free some space for Rice and let him go back to his all-star form of a few seasons ago. It’s nice to see Owen Daniels scooped up in the offseason because Flacco loves his TE check downs and adding another sturdy one next to Pitta should only help Flacco’s completion percentage which usually floats in the toilet somewhere. To Flacco’s credit, he has a significantly higher ratio of downfield passes then the rest of the QB’s in the NFL and thanks to some motivational help from myself (see @BLFCsports tweet where I suggest Steve Smith to the Ravens and hour before they sign him.) 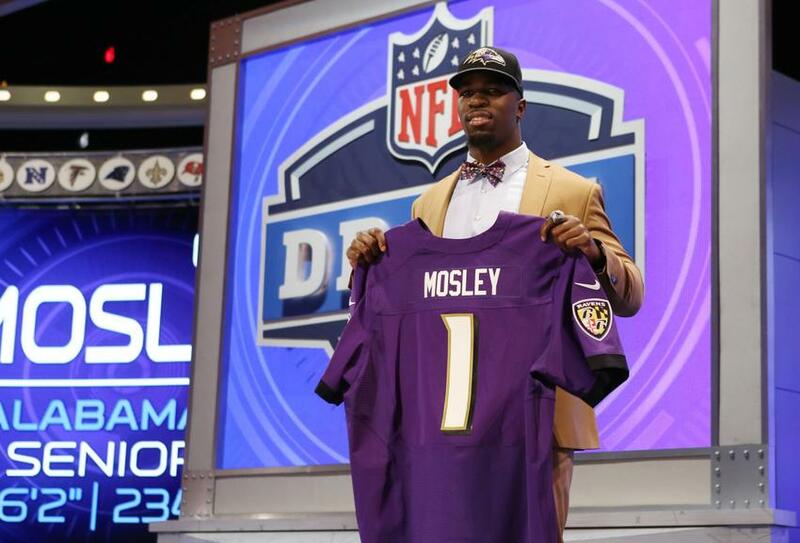 You can expect Flacco to be up in arms throwing bombs downfield to “The Law Firm of Smith & Smith Associates.” What I can be most excited about for the Ravens this year is their first round draft pick CJ Mosley. This is a big deal because the need for an inside linebacker was there last season for the Ravens and not only did you get one, you got an “NFL ready” one. Stacking him up with Suggs and Dumervil should create a lot more sacks then people will think. It’s too bad that Aaron Ross went down for the season too already, he’s no playmaker but he too would have been a nice compliment to Matt Elam on the back end of the defense. I see the team getting statistically better but I’m not sure yet if their record will reflect it. Another 8-8 season could be in their future. Lastly, it was only deserving I slot the Browns last in this run down because of all the media attention they have gotten this offseason. I won’t dwell tooooo much on the Manziel pick because I am sure you are just as fed up with that scene as I am. Here’s what I will say about that team. Their defense behind Joe Haden and company is already a playoff caliber defense. Their off-season pick-ups of veterans Dansby and Whitner will make offense for their opponents much harder than it needs to be. The Browns only real issue is their offense. The one that only has one wide receiver in Josh Gordon and chose not to draft one…and then lost Josh Gordon. Now I will say their offseason pick-ups of Miles Austin and Nate Burleson to compliment Jordan Cameron actually is a solid enough core of wide receivers. There are no playmakers there, but there are catches to be had. This “open” QB competition appears more and more lopsided by the minute in favor of Hoyer. It is a shame too, I understand the Browns aim to put Johnny Football in his place but knee-capping him I don’t think is the way to go about it. Ask Rex Ryan how that worked out for him with Tim Tebow. (For no reason am I comparing Manziel’s talent to Tebow’s…just alluding to the same scenario that appears to be playing out here.) Manziel is going to get his time, and I got a feeling his MO is going to be a 350yds-3TD-2INT stat line. Something to get excited about if you are a Browns fan. I hope Hoyer the Destroyer plays this team to a few wins but if he starts getting shelled and they start calling for Manziel, everyone will come out a loser in that scenario. Know this, in the last 4 college seasons; the highest Total QBR belongs to Bradford in ’10, Luck in ’11, Wilson in ’12, and Manziel in ’13. Wilson has a Super Bowl Ring, Luck has a playoff win under his belt, and Bradford was coming off his best career performance till his injury last year. A much improved Browns team this year still fall short however of playoff hopes and finishes with a 7-9 record.